Hollywood, CA. 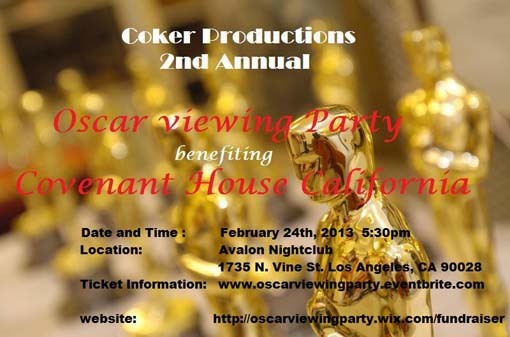 ( January 16th,2013) - Coker Productions presents its Second Annual Covenant House California Oscar Viewing Fundraiser and Dinner Gala on February 24th, 2013 at the historic Avalon nightclub in Hollywood located at 1735 N. Vine St. Hollywood, CA 90028. Red Carpet arrivals begin at 5:30 pm. “Covenant House programs can mean the difference between a life of danger on the streets or developing the skills for meaningful work, finding stable housing and establishing an independent of life of dignity,” said Melanie Merians, CHC chief development and communications officer. This year’s ticketed event features viewing of the Oscar’s on three large cinematic screens in HD with stereo surround sound, a silent auction, dinner, a no host bar, and Academy Award winning musical performances by El Debarge, Jr., Bonnie Pointer, Sunn St. Clair, Robbie Wyckoff with more names to follow. The event hosts are award-winning Broadway, television, and film actor Terrence “T.C.” Carson and the beautiful TV and Film actress Liana Mendoza, who will also perform the Oscar-winning duet “A Whole New World” from Disney’s animated feature film Aladdin. For tickets and sponsor opportunities, call 310-497-0122. This is a media friendly event. Contact oscarviewingparty@gmail.com to request press credentials or arrange interviews with the talent by February 10, 2013. Covenant House California is a non‐profit agency dedicated to transforming the lives of homeless, trafficked, and at‐risk youth ages 18 – 22. CHC’s core services include: food, clothing, shelter, crisis intervention, medical care, employment and educational training, job referrals, life skills classes, and other critically needed services. CHC is open 24 hours a day, 365 days a year. Services are free for youth. Eighty percent of its funding comes from private donations.